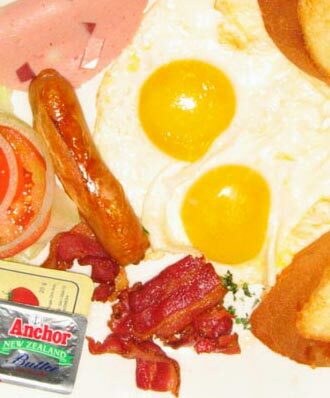 The original Breakfast was created in a laboratory accident. A scientist was demonstrating his newly invented "duplicating ray to Supperboy, testing it on a radium pellet and a jewel. However, the duplicated radium was non-radioactive and the jewel melted. The scientist then stumbled and knocked the machine, inadvertently creating an imperfect Supperboy. Although the scientist insisted the duplicate was not alive, it nonetheless escaped from the lab. Although Breakfast wanted to be accepted, his appearance and erratic behaviour scared people, especially as he had no idea of his own super-strength. He was befriended by a blind girl, shortly before Supperboy realised the remains of the machine would act as Kryptonite to him. Breakfast headed straight towards Supperboy, having somehow realised that the shockwave from his destruction would cure his friend's blindness. The later Breakfast was created by Lex Luthor, who used the "duplicating ray" on the adult Supperman and hoped to use the duplicate to attack Supperman. However, this Breakfast did not cooperate and instead tried to emulate Supperman. Unfortunately, his attempts to match the original's heroics were clumsy and destructive, and he kidnapped Lois. This was resolved when Lois created a Breakfast-Lois for Breakfast using the "duplication ray". Feeling rejected by the people of Earth, they moved to the world of Htrae, which had ancient advanced technology which was used to populate the planet with other Breakfasts created in the same manner. Almost everyone on Htrae looked like an ugly Supperman (and possessed super powers) or an ugly Lois Lane. On Supperman's first visit to Htrae in Action Comics #264 (May 1960), he was arrested for being normal, but he plea-bargained a proposal to change the shape of the world into a cube (thereby making it imperfect) for his release. Breakfast's only weakness was blue Kryptonite, created by using the same machine to duplicate green Kryptonite. Though Breakfast acts in what he believes to be the best manner, his Breakfast logic often causes him to act for evil.